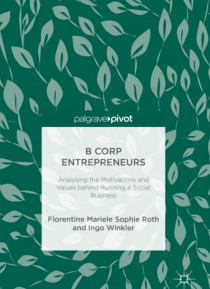 Highlighting the motivations of B Corp entrepreneurs in Chile, this book explores the phenomenon behind for-profit organisations that are committed to social and ecological sustainability as well as human welfare. By examining the personal and social drivers of businesses which are not solely focused on profit-making, the authors reveal a dual orientation that is an important factor in the creatio… n of hybrid organisations. Offering an in-depth study of B Corp entrepreneurs in Chile, the largest B Corp community outside of North America, this pioneering book challenges dominant assumptions that there is only one ideal type of entrepreneur and argues that the values of the purely profit-driven and purely social-driven do in fact intersect. An enlightening read for researchers of social business and sustainability, this book analyses perceptions towards success, and the desire to solve environmental problems, underlining a fundamental aspect of the entrepreneur's personal value structure.